Tapestry was founded by a Choctaw Indian woman to operate out of Indigenous worldview. The Circle common to many Indigenous peoples helps to explain Tapestry’s organizational system — how we see the world around us and our place in it, and therefore what we do and how we do it. The fact that we use the Circle to explain more than one aspect of ourselves and our work reflects the explanatory power of the Circle itself, as a map of reality to Indigenous people. Tapestry uses the Circle as a way of understanding and explaining the ways that people know, learn about, and respond to the natural world. “Typifying” or “categorizing” something like “ways of knowing” provides a tool that can help us better understand the ways people learn and know in general, though the categories are obviously not absolute. But the Circle can provide insight that enriches other models of human knowing and learning. To Indigenous peoples, the Circle illustrates “the way the world works” — from seasons to weather patterns to human lives. Using the Circle to understand Tapestry is therefore not simply symbolic or metaphorical, as it would be in contemporary modern worldview. It has strongly mythic overtones that help us understand many different things. For example, the Medicine Wheel used by many peoples of the American Great Plains associates the four directions with Mind, Emotion, Spirit, and Physical Body. Northern Cheyenne horse trainer and elder Phillip Whiteman, Jr. applies the Medicine Wheel to understanding horses by associating the four directions with “the stages of life and behaviors that come with the stages” (as well as all the things just discussed). It’s important to realize that the inherent richness of the Circle’s meaning also leads to variation in how it’s depicted. Different tribal traditions ascribe slightly different colors and meanings to some of the quarters. 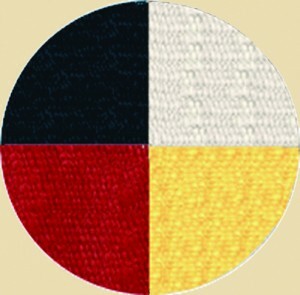 We have chosen to use largely pan-tribal designations of yellow, red, black, and white for the cardinal directions, which happen to also be the colors used by the Choctaw for those four directions. But that does not mean this Circle is “the definitive” Native American circle; there is no such thing. On the other hand, there are limits to the Circle’s variation and deep roots to its symbology. It is in this middle ground between “only one right way” and “anything goes” that Tapestry seeks to inform, educate, and empower. East is associated with Intellectual Ways of Knowing and Learning. South is associated with Experiential Ways of Knowing and Learning. West is associated with Spiritual Ways of Knowing and Learning. North is associated with Mythic Ways of Knowing and Learning. The Center is associated with Integrated Ways of Knowing and Learning. We suggest you visit the East as your first step in exploring the Circle.